6th Gen Core i7 6700 (Not K models). 6th Gen Core i5 6400, 6500, 6600, (Not K models). Socket Type Compatible with Socket 1150/1151/1155/1156. All 6th Gen Core i3. All 4TH Gen Core I3. CPU Socket Type: LGA 1155/ 1156/ 1150. Aluminium Heatsink and centre. For CPU with thermal output of 65w or less. AMD Socket 754, 939, AM2, AM2 , AM3, AM3 , AM4, FM1, FM2, FM2 . Or are you a syatem builder who needs a price competitive yet quiet cooler for mainstream PCs?. The Alpine 64 GT is your choice - quiet, efficient and quickly installed! The ultra-quiet 80mm PWM fan and an optimized heatsink give the Alpine 64 GT the best price / performance ratio. Or are you a system builder who needs a price competitive yet quiet cooler for mainstream PCs?. Socket Type Compatible with Socket 1150/1151/1155/1156. CPU Socket Type: LGA 1155/ 1156/ 1150. Type Heat Sink with Fan. Pin Connector 4-pin Fan Connector. Product Info Material: Aluminum. Connector: 4pin PWM. High performance ultra-quiet cooling fan designed for desktop computers. - With wear-resistant fluid bearing structure, the fan is more durable and has longer service life. 1 Piece CPU Cooling Fan. High performance ultra-quiet cooling fan designed for desktop computers. 1 Piece Desktop Cooling Fan. - With wear-resistant fluid bearing structure, the fan is more durable and has longer service life. Sold in good working order. Serial number recorded. Fast dispatch from London. High performance ultra-quiet cooling fan designed for desktop computers. 1 Piece CPU Cooling Fan. - With wear-resistant fluid bearing structure, the fan is more durable and has longer service life. Provided with double fans, the item is highly efficient in heat dissipation. 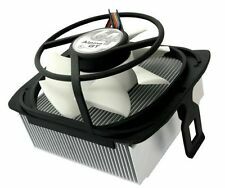 - High performance ultra-quiet cooling fan designed for desktop computers. 1 Piece CPU Cooling Fan. - With wear-resistant fluid bearing structure, the fan is more durable and has longer service life. High performance ultra-quiet cooling fan designed for desktop computers. 1 Piece Desktop Cooling Fan. - Made of fine copper material, the fan ensures better heat dissipation. - With wear-resistant fluid bearing structure, the fan is more durable and has longer service life. Rotary Speed: 2200±10%RPM. - Provided with double fans, the item is highly efficient in heat dissipation. - High performance ultra-quiet cooling fan designed for desktop computers. 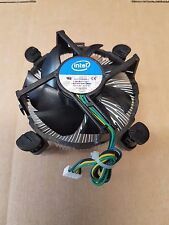 1 Piece CPU Cooling Fan. High performance ultra-quiet cooling fan designed for desktop computers. - With wear-resistant fluid bearing structure, the fan is more durable and has longer service life. - Bearing Type: Fluid. 1 Piece CPU Cooling Fan. 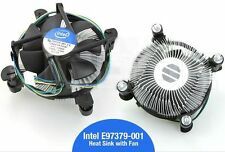 Genuine Intel® (1150,1151,1155,1156) Core i3,i5,i7 CPU Heatsink Fan. Condition is New. Dispatched with Royal Mail 2nd Class. 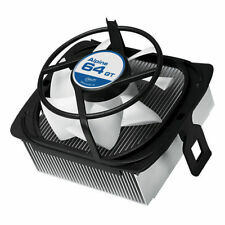 AMD CPU Coolers Arctic Alpine 64 GT CPU Cooler for AMD CPU's. 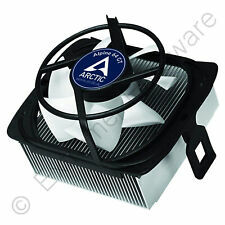 Arctic Alpine 64 GT CPU Cooler for AMD CPU's. AM3/AM2/AM2 /FM1/FM2/939/754 Support. Socket Compatibility 939. Fan Speed 2000 rpm. Product Specification. Type: 8cm Case Fan. Blow warm air out of the case. 3-Pin fan with standard case. Fan Connector(s): 3-pin. Fan Bearing: Fluid-dynamic. Long Service Life. Colour: Black & White. Draw cool air into your case. Original Intel i3 i5 i7 Socket 1150 1151 1155 Heatsink Fan Cooler E97379-001 . Dispatched with Royal Mail 1st Class. Made of fine copper material, the fan ensures better heat dissipation. 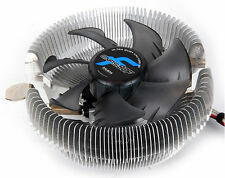 - High performance ultra-quiet cooling fan designed for desktop computers. 1 Piece Desktop Cooling Fan. - With wear-resistant fluid bearing structure, the fan is more durable and has longer service life. High performance ultra-quiet cooling fan designed for desktop computers. - Provided with double fans, the item is highly efficient in heat dissipation. - With 12 LED lights, it looks stylish and attractive. 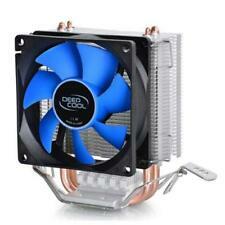 UCACO-P1600-GBA01 Arctic Alpine 64 GT CPU Cooler - UCACO-P1600-GBA01 (Components > Cooling Fans Modding). The user-friendly mounting system on the cooler is very easy to install. Drives and Storage. Other Drives and Storage. The Alpine 64 GT Makes Your. The Alpine 64 GT is your choice - quiet, efficient and quickly installed! The ultra-quiet 80mm PWM fan and an optimized heatsink give the Alpine 64 GT the best price / performance ratio. Type: 8cm Case Fan. At low fan speed, the motor noise is key. A motor developed in Germany with a new alloy/lubricant combination reduced friction and noise. Fan Connector(s): 3-pin (4-pin Adapter). Perfect Case Fan Regulation with PWM. The PWM function allows the motherboard to run the fan precisely at its necessary speed. If you want to improve the cooling efficiency of your computer you get several case fans working in parallel (since it takes 10 fans to double the noise level). Perfect Case Fan Regulation with PWM. The PWM function allows the motherboard to run the fan precisely at its necessary speed. - Blow warm air out of the case. USB/Pen/Key/Flash Drives. Hard Drive Caddies. Manufacturer : Arctic Cooling. Marke Arctic Cooling. ONYX computer Competence for more than 20 years. Phone Support. This dealer warranty will not restrict your statutory rights (i.e. the "warranty"). The user-friendly mounting system on the cooler is very easy to install. Limited Warranty: 6 years. Rated Fan Speed: 500 - 2000 RPM, (PWM). 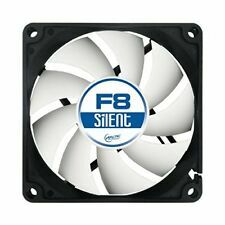 Arctic F8 Silent 8cm Case Fan Black & White 9 Blades Fluid Dynamic 6 Year Warranty - ACFAN00025A (Components > Case Fans). For Cadmium and Hexavalent chromium, there must be less than 0.01% of the substance by weight at raw homogeneous materials level. Hard Drive Caddies. Height: 2.5 cm. Weight: 71 g. Tape and DAT Drives. Rated current: 0.053 A. Suitable for: Computer case. Maximum spin speed: 1200 RPM. Maximum airflow: 15.1 cfm.